Spread holiday cheer across the office this season, starting with online invitations from Evite. 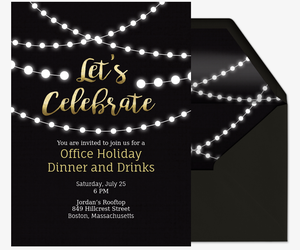 Our free and Premium designs are the most beautiful, affordable, and easy way to engage company employees, coworkers, and other industry professionals in celebrations at the office or at another venue. Plan parties big and small, from themed celebrations to office potlucks. 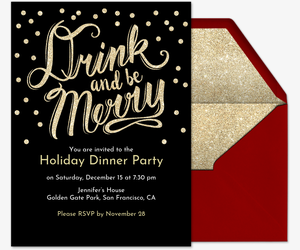 Paperless invitations make the holidays stress-free, even in the office. Send invitations to the entire company in seconds, then seamlessly track RSVPs, manage your guest list, create What to Bring lists and custom polls, send messages, and more on one virtual page -- or on the go with our mobile app. For a personal touch, you can customize our upload-your-own invitation templates with your own photos, or our design-your-own invitation templates with full, pre-existing designs. Your Evite invitation also provides a personal space for you to share photos, post comments, and socialize with other guests, so you never miss another moment. Invite the hardworking employees with Evite Premium, our paid, ad-free option for when only the best invitations will do. Premium invitations come with matching digital envelopes and stamps, as well as inserts for photos and extra messages. Pricing is determined by your number of guests. Make sure your office party exceeds expectations with pro-tips from Evite Party Ideas. Check out our holiday office party guide as well as our dos and don’ts for non-seasonal office parties. Plus, read up on our holiday entertaining shortcuts, recipes, DIYs, and other ideas. Planning another office event? Browse our professional events invitations. Or, browse more holiday designs in our holiday party collection. Evite can help you celebrate all of life’s occasions, from the everyday to the milestones. Browse designs for birthday parties, baby showers, dinner parties, and more.